When I Googled it, there were several threads from various sites about modding certain flip covers to work on the TRS-25. I did a little searching too and it appears that the TRS-25 isn't exactly made for flip covers because there's not much space for them. Thanks for helping me out, Rick. I guess if nothing else I can pick up a mini red dot that has flip covers from the factory. Just out of curiousity, how many rounds total did you run through it? I ask because when I bought my wife an LCP, when we took it to the range, the two of us made it through I think 5 mags total (1 of JHPs, 4 of FMJ) because it was just so unpleasant to shoot. I have been carrying an LCP since the year they were introduced (2009 IIRC). I retired my first one and upgraded to an LCP Custom two year ago. I qualify on it as my back up gun 2x a year and shoot at least 5 mags through it every time I practice with my sidearm, which is approx. twice a month. 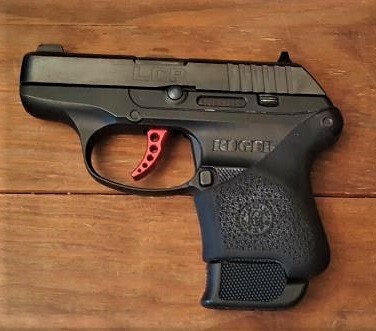 What has made the gun pleasant for to shoot, for me, is using the +1 extended mags and the Hogue grip that uses the rear frame pin to hold it in place. They make a similar grip for the LCPII that uses only friction fit. Both add-ons give me something to hold onto and also absorbs much of the recoil. I just ordered that model grip as an add-on item when I placed an order on Amazon. I should have it by Saturday so I'll be able to try it out this weekend and see how I like it. Only $8.76 as an add-on. I think you'll like it. After shooting mine both my dad and my father in law put them on their respective LCP's. I thought they would be problematic for pocket carry but I barely notice the difference in the pocket but really notice a difference on the firing line. That echoes what I've found after putting them on my B6P and my .45 Shield. They fill my hand better and don't interfere with my draw or how I choose to carry the weapon, so I'm confident I'll like how it works on my LCP II. Does anyone have any hands one experience with the Law Tactical folding stock adapter? Looking for a folding stock option on a project..
Or are there better folding stock options out there? I noticed that nobody addressed your question here. Me? Personally...no I have not. Are the results catastrophic if you do fire a round with the stock folded? No, the weapon simply won't cycle. I don't know of any other options for a folding stock but haven't looked for one. One of the guys at work has one. He uses it to keep his rifle stowed up front in a small rack. Well, there's whatever SiG did with the MCX, but I think that's a complete weapon, and the parts don't work separately. SIG MCX is a completely different design. and then it is exactly the same as an AR15. There's a similar setup by Sylvan Arms, but the reviews were pretty negative and as memory serves it's 3/4 the cost. I wonder how hard it would be (or if it's legally possible) to emulate the old Olympic Arms buffer-tube-less uppers and slap a top/bottom folding wire stock on an otherwise stock AR. Don't know but as a pistol it could be under 26"
The Olympic Arms thing was a pistol; they had a few versions to match various AWB characteristics. Here's a Forgotten Weapons video about it. Seems like the design could be tweaked to run SBR or full rifle. I wonder if you could sorta combine the extra top bit with a slightly modified gas system, so the return spring was wrapped around, say, a reinforced gas tube. You'd probably have to raise the gas block so the tube's straight, and thus lose compatibility with standard gas blocks and at least some handguards. which was a licensed design from some dude named Allan Zitta. who supposedly made them for some HSLD units or government agencies. there used to be a video up on YouTube of pro shooter Todd Jarret showing the disassembly of a ZM 300 rifle. Man... I miss the old Pre-Remington-Absorbion Para. My first and only 1911 was a P14 I sold a couple years back. I remember all the hype for their new products that never came out prior to the buyout. It was when I was getting "back into guns" in college. The P14 was a good gun. A friend of mine bought one when they first came out. I was jealous cuz I was broke at the time. There is a certain amount of gun snobbery in USPSA pistol competitions. The Para 16-40 was the poor man's Limited division gun...or poor man's version of the STI or SVI 2011.
they may or may not work, but you can always search YT for "Todd Jarret + ParaUSA TTR". EDIT: I meant to say that link may or may not work. I've never had to worry about being inconspicuous with my long guns going to and from the range - I just put them in long cases in the back seat of my truck. I do know that our local motorcycle cops use SBR ARs, top separated from the bottom, in special locking boxes on their motorcycles. I splurged last month and bought a Sig MCX hybrid in .300 Blackout. with the stock...err...I mean brace folded, it fits in a normal sized gym bag or tool bag. I have a back pack. I will have to see if it fits. My "gold standard" has always been a tennis racket bag. But then again in a context like if people were bugging out and the S was about to hit the F, you and I would know that if we saw some dude walking down the street at a quick pace with a Wilson racket bag slung over his shoulder, he's not meeting up with friends for doubles tennis. Conversely, in our current fat, dumb, and happy mode if a ne'er-do-well were to see a racket bag in the backseat of your car, he might just pass on by. I was mentioning this to my wife, in hopes I could get a gun which would fit in a tennis racket bag...and get a tennis racket bag to match. My wife suggested I start leaving my car pistol in a diaper and leave it wadded and in a bag like it was a dirty diaper. I don't know that a full sized pistol would fit a child's diaper, but a compact or micro will. A full size might fit in an adult diaper. A diaper is a brilliant idea. As to whether or not a full size firearm would fit. Use two diapers taped together and make it look like a "blow out " in a baggie. Not a soul would touch it then. My wife used to keep her pistol in the diaper bag. In order to tote a diaper bag I'd have to have more kids wearing diapers.